Dynamica allows the user to explore how animal populations and communities change through time. The program uses a long-term data set from the Severn Estuary, England. Since 1980 fish and crustacean samples have been collected from Hinkley Point 'B' Power Station. Data are presented on every fish and most large crustaceans known from the estuary, producing an exceptional data set for those interested in population dynamics. Users can explore real data, and reach their own conclusions about how animal numbers are inter-related and change through time. The data consist of monthly abundance estimates of fish and crustaceans from January 1981 to January 1995. Time series for more than one hundred species are available for study. Details about data collection and habitat are also given. Dynamica was designed as a research tool to help explore the complex inter-relationships between species and environmental factors such as temperature, salinity and tides. 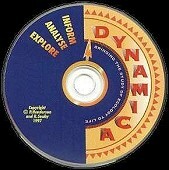 The strong theme running through Dynamica is the study of community-level dynamics. Books often portray communities and food webs as static entities. This program will show you just how dynamic food webs are. Perhaps the most popular community statistic is a diversity index; Dynamica will let you compare different indices and appreciate how they change through time. Dynamica has been designed to be useful to anyone with an interest in natural time series. It presents a range of elementary techniques for time series analysis, including data transformations, autocorrelations, moving averages and fourier analysis. The program presents a wide range of natural dynamic behaviours which make good examples for study. One of the most vivid features of Dynamica is its animated food web, which demonstrates clearly how dynamic and variable a food web is through time. In a few minutes' exploration you can gain much insight into the dynamics of natural systems. Having developed a feel for the data a student can then move on to form and test hypotheses on subjects such as the role of temperature, salinity or predator-prey interactions.